Voice Performers include: Norman Alden, Michael Bell, Ted Cassidy, Danny Dark, Jane Jones, Joyce Mancini, Chuck McClennan, Barney Phillips, Olan Soule, William Woodson, Casey Kasem, Louise “Liberty” Williams, Michael Rye, Wally Burr, Fernando Escandon, Ted Knight, Shannon Farnon, Jack Angel, Regis Cordic, Ross Martin, Richard Paul, and Mike Road. After the disappointing performance of 1973’s Super Friends series, ABC decided to try again with this new animated program. A group of heroes from the Justice League of America work together to save world from a variety of evil forces. Working out of the Hall of Justice headquarters, the team’s core heroes are Superman (Danny Dark), Batman (Olan Soule) and Robin (Casey Kasem), Wonder Woman (Shannon Farnon) and Aquaman (Norman Alden). They are informed of catastrophes by the TroubAlert computer. Joining the team are Zan (Michael Bell) and Jayna (Liberty Williams) the Wonder Twins. These teenagers are heroes in training and have the ability to change their shapes after touching one another. Zan can assume any form of water while his sister, Jayna, can transform into any animal. Their pet is Gleek (Michael Bell), a mischievous blue Space Monkey. Gleek frequently gets into trouble and gives the series comic relief. The heroes typically work together but are sometimes joined by other heroes of varying cultural and ethnic backgrounds. They include Black Vulcan (Buster Jones), Apache Chief (Michael Rye), Hawkman (Jack Angel) and Hawkgirl (Shannon Farnon), Rima the Jungle Girl (Shannon Farnon), The Atom (Wally Burr), Green Lantern (Michael Rye), Samurai (Jack Angel), and The Flash (Jack Angel). Each episode is made up of four segments. The first features two heroes from the core group. The second segment revolves around the Wonder Twins and Gleek and includes a practical lesson for the young viewers. The third segment is considered the primary adventure and includes the entire team. The last story features a team-up of one of the main heroes and a guest. Episodes also include short segments about safety, basic first aid, simple magic, and riddles. The series is narrated by William Woodson. Due to childrens’ television guidelines of the time, episodes have very little violence. The Protector — A sea pirate called The Pirate tries to steal enough to create an army and becoem the ocean’s sole protector. Thankfully, Batman, Robin, and Aquaman are able to thwart his plans. Stowaways — Two young girls stow away on a yacht that’s bound for Catalina Island. The Wonder Twins come to their rescue when the ship’s captain is knocke dout during a storm. The girls learn that stowing away isn’t always as fun as it might seem. The Ghost — The ghost of Gentleman Jim Craddock returns for revenge on Superman and Wonder Woman for sending him back to his grave years ago. He starts by changing world officials into ghosts at the Metropolis Convention Center. He demands that, unless Superman and Wonder Woman meet him at his grave, he will do the same for all of the world leaders. Batman and Robin find Gentleman Jim’s hideout but become trapped in a watery pit and are rescued by the Wonder Twins. Having run out of time, Superman and Wonder Woman agree to meet the villain to give the others time to find a way to stop the ghost. Gentleman Jim turns them into ghosts who barely recognize their friends. The other heroes discover that special gems will protect them from Gentleman Jim’s powers and a special disk can be used to return the ghosts to normal. Once Superman and Wonder Woman are restored, the heroes use the Rods of Merlin to defeat Gentleman Jim. They surround him in seven directions and force him back to the grave forever. The special discs are used to restore the world leaders and the heroes enjoy a good laugh to finish the adventure. Rampage — Superman and Green Lantern must stop a great white elephant from trampling a remote village in India. It turns out that the elephant is upset because her baby has been trapped in a canyon. The heroes rescue the young packiderm and disaster is averted. First aired: December 16, 1977. 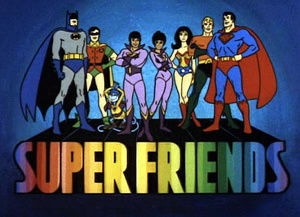 The heroes returned in subsequent Super Friends series. There hasn’t been any new plans to revive the show or this particular version of the characters. The two Justice League shows were better than this crap.